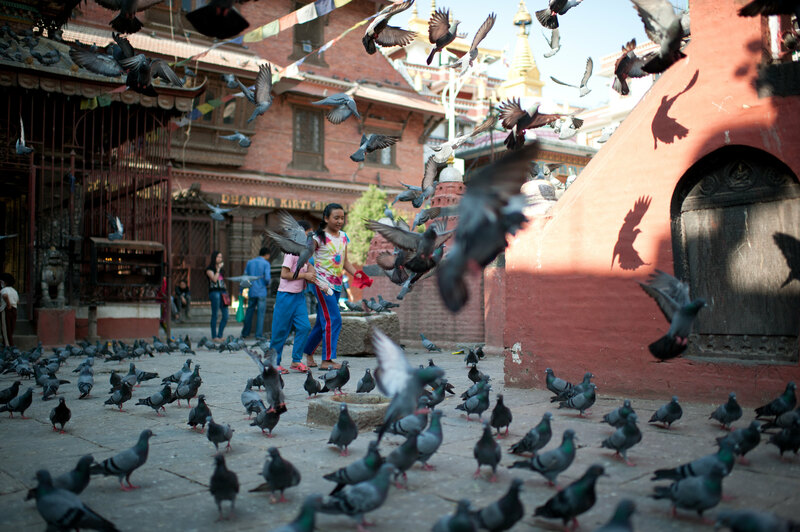 Though their country was disastrously torn only a few days before, children blissfully enjoying a warm afternoon with a flock of pigeons around the Vihara Dharma Kirti in Kathmandu. Space is one of the main features of all journey, and Nepal –one of the world’s poorest countries– never fails to attract travelers of all nation to fill any void. From the prairies of Chitwan, to the thick snow of Everest. The dusty city of Kathmandu with its diverse culture and English-proficient locals seeking a little income, is a location often chosen by the travelers. Also is the city of Pokhara with the World Peace Pagoda (commonly known as the Shanti Pagoda). In Nepal, Buddhism (and Hinduism) is a firmly-held teaching. For they believe that what the Buddha teaches, is not only goodness, but also how to be a purposeful individual, be that to themselves or others. More than dozens of ethnic descendants of Indian migrants, Chinese, and Burmese coexist in Nepal. Herds of bovine are let loose, and motorists stop and turn-off their engines every time a small number of these beautiful-creatures decide to sit or lay-down in the middle of the road. I spent four days in Kathmandu, before proceeding to Pokhara to participate in the childcare program as volunteer for four weeks. Everything that I and Ammar Alhaddad –a volunteer from Jeddah– see in Kathmandu is quite far from what we’d imagine. It’s almost like Jakarta, only three times more cluttered and noisy. A mesh of traffic-mess and the locals hospitality in Kathmandu actually opened our eyes to a chaos-veiled beauty. Rajesh Thapa, a staff of the Hope And Home Orphanage in Kathmandu, works as tour-guide for travelers and volunteers from all countries. Rajesh’ humorous personality made him easy to communicate with. I prefer not to be reminded of our differences, since a humoric nature lets us understand a culture more for it is presented in a light and pleasant form. Rajesh easily and wittily discuss the dos and don’ts in such a non-patronizing manner. Rajesh in essence enlightens us with information that graces us with contemplation. Around 4.00 in the afternoon, me, Jenning Gan, and Shirley Liu arrived in Pokhara after a three-day orientation and seven-hour journey on a from Kathmandu, through roads sandwiched between deep-cliff and steep-valley. The next day, we went to a lakeside riding a public-bus. In Pokhara, it never crossed my mind that Tibetan and Nepalese trinket souvenir shops to be any more neatly structured here than in Kathmandu, so as the crowd-infested bars too. It seems that Pokhara may be more suitable as the nation’s capitol. Many happy drinkers serenaded by reggae-music in warm, low-lit restaurants serving a variety of food, a big photograph of Bob Marley, and Jamaican flag on the wall. There’s also a modern coffee-shop such as Himalayan Java Café that pampers its patrons with the view of Lake Phewa. Pokhara is also explorable by foot, and I witnessed many surprises by the lakeside. Khrisna and Diki Thapa often take the role as temporary foster-parents to the volunteers and let their house open for them. The orphanage is only 50 meters away from their house. In makeshift English, Diki Thapa shows the names of volunteers and e-mail addresses written neatly in her Guest-book, and expresses the longing for cheerful and merry times as when the volunteers took residence in their house. I climb each step of the stairway leading to the flat roof of the house, and take a deep breath upon watching the majestic view of the Everest that’s clearly visible in the morning. The temperature is quite chilly. Such a simple way to fall in love to the Grace of God’s creation. April 25, 2015. After 11.00 am, one of Nepal’s nightmarish scenario materializes. All activities in Kathmandu has come to an abrupt halt. A devastating earthquake turned everything into panic and distress, then proceeds to mournful cry for the loss of thousands of Nepalese in a blink of an eye. Monkey Temple and Durbar Square that I visited a few days before departing to Pokhara with other volunteers perish along with tales that were proudly honored by locals. Khrisna and Diki Thapa turn the television on only to find news from Kathmandu, then switched them back off upon witnessing the pandemonium and ruin, reported from Kathmandu a few hours after the 7.8 Richter Scale took place. Now, the whole world knows of the disaster as foreign TV stations report that the earthquake is centered 77 kilometers, North-West of Nepal’s capitol, Kathmandu. It is also reported that all buildings in the Gorkha village has been rendered paralyze by the forceful earthquake. Khrisna Thapa tries to remember a story told by his father of an 8.1 Richter-Scale earthquake that shook Nepal 81 years ago.Since then, Nepalese residence, from one generation to the next, prepare themselves to face any possible return of such unforeseen disaster, inevitable by any human being. They’d never be able to tell when and how hard it would strike to demolish fragile buildings. It’s been almost 80 years, Nepal citizens live a peaceful and safe life after the last big earthquake in 1934. But now, for Khrisna Thapa, the natural disaster that gripped Aceh in 2004 is far more horrifying than any that has hit Nepal. “We will never know when an aftershock will happen and how bad it will be because man has no control over and avoid natural disaster. We’re standing on a ground that is subject to rumbling at any given moment.” He said. I can see Khrisna as one of very few Nepalese still living under the shadow of the 1934 earthquake. Many tourists left for feeling unsafe, but many also stayed to help the locals raising funds and buying basic-needs in demolished areas because the buildings there were built on makeshift architecture. They’re built only with bricks mortared in mud, without any cement or concrete reinforcing the exterior. Though there were many difficulties, Rajesh Thapa never ceases to look for help and share stories to wanderer-friends he knows in Kathmandu. In a professional fashion, Rajesh knows what he must do to rebuild the ruined places albeit they may not return to how they were originally. He also expresses his hopes about the changes he’d like to see to his country’s tourism industry. Dozens of foreign volunteers in Nepal wanted so much to offer their help, but they –including myself– were reminded by our conscience; that no matter how sincere our intention may be, right now, we are not in our homeland, far from our own home and families. People who love us are hoping to be reunited with us, safe and sound. Reluctantly, I’d have to terminate my voluntary program under the order from the Indonesian Embassy to return to Kathmandu and report in. Followed by the request to immediately see Embassy’s foreign-affairs officials at the Kathmandu Guest House located on Thamel Street, a narrow and dusty road filled with visitors and hiking equipment sellers. Two days prior to returning to Indonesia upon the Ambassador’s request, I decided to walk the Thamel up to Durbar Square with my camera. Almost all building previously lining the whole street has been laid to waste, though a few are still standing. Wreckage are not only seen in a couple of places, and almost all are guarded by local police to fend away disturbance by locals or tourist who couldn’t keep their curiosity in check. Many open spaces were gone due to the occupation by items desperately saved from the rubbles of houses and buildings. The place has gone from a center of trade and tourism to a landmark of sorrow. As I grabbed my camera, I found myself in gripping silence. Jenning Gan laughs as her local step-mother Diki Thapa encourages this Malaysian born volunteer learns to wear a Sari. This Buddha Eyes emblazoned Stupa in the temple complex west of Kathmandu still stands firmly after the earthquake hit Nepal last April. 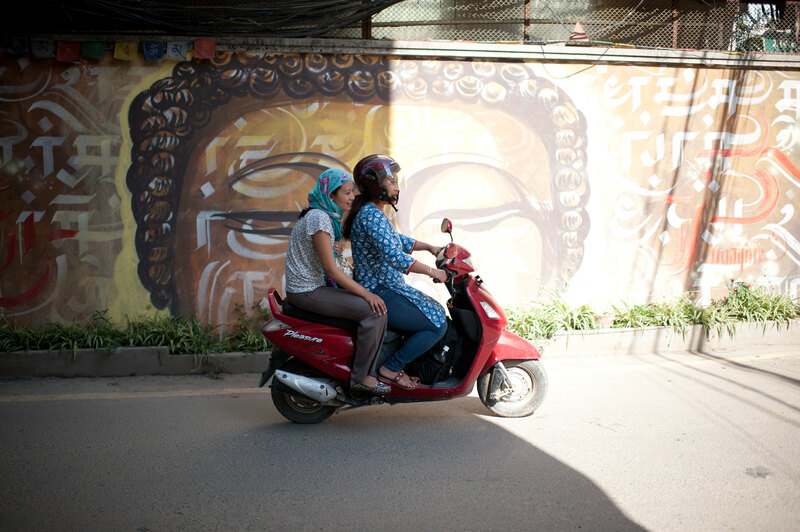 Motorcyclists passes by a mural of a half of Buddha’s face. Murals and graffiti lace the walls by the streets of the city of Kathmandu as a form embrace towards the modern culture (below). 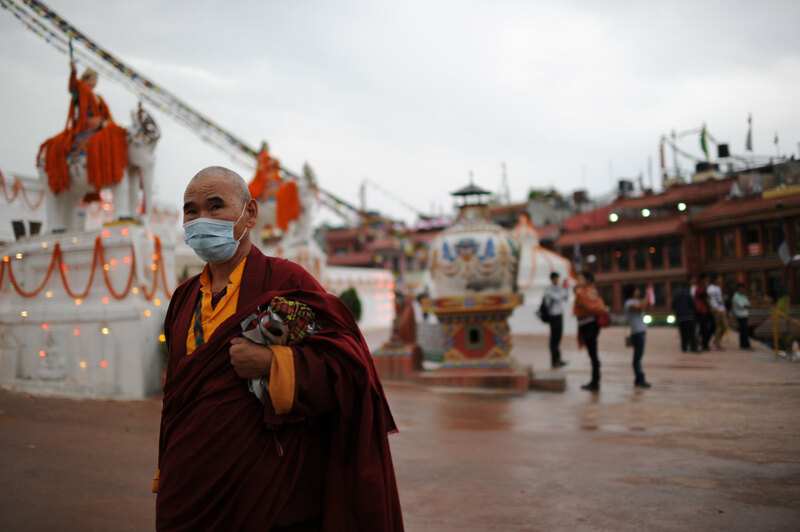 Wearing a disposable respiratory mask, a Bhikku walks in front of the Boudhanath Temple. 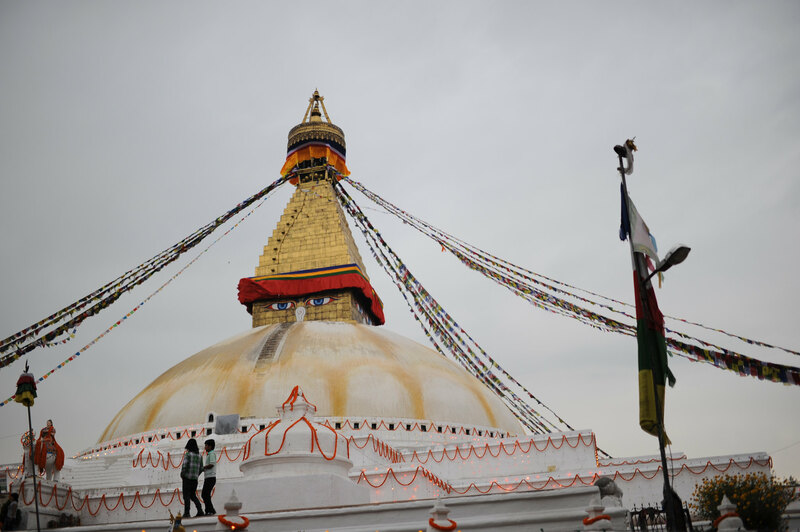 The largest Stupa of Buddha in Nepal resides in this temple. Apart from pilgrims, this UNESCO World Heritage Site temple also attracts many tourists. I didn’t insist on taking a perfect picture, but rather try to capture how I feel as I witness what is in front of me. A formerly amazing city: toy-whistles, dog-barks, non-stop honking cars, bicycle-bells, and children singing, even the usually uplifting breeze, now fades. Everything transforms into fear and despair for the future. Walking back to the Kathmandu Guest House, I’m not sure whether I should purchase anything as a souvenir from this country. My eyes scan along the side of the road I’m tracing and see praying flags sold by almost all trinket shops in many sizes. My gaze then stops at a small store named Paradise Book Shop on the corner of Thamel. As it turns out, it’s a quite unique bookshop selling many second hand books in many languages like Nepali, Chinese, Indian, and English at relatively reasonable price. There I found many early prints of books by Franz Kafka and Agatha Christie. A JOURNEY is more meaningful as we adapt to the surrounding and nature of where we visit. What we encounter in a new place, far from our homeland possesses very different norms and traditions to what we are accustomed to. Initial confusions as we set foot on unfamiliar land will turn to understanding as we open ourselves to new things. Wander as far as you can, interact with the locals as much as you can, trusting that they will help and explain many things that may have escaped the tour-guide’s itinerary. Be lost, and find yourself in the embrace of a tradition that infatuates you and makes you change your mind about going back home. A sacred thing for me as a traveler and volunteer in another country is the awareness that I have done my utmost sincerity in respecting that country’s local culture. To me, a story is a priceless souvenir compared to any items bought with money. And to that, is why this is written.